Come and help the valiant NATO troops to expel the invading Warsaw Pact dogs from the Fulda Gap in Germany! Your NATO Commander for 2013 is Sir Raymond of the CEF. This is a fictitious battle situation, which could have happened, if the Soviets had decided to invade Western Europe. You can expect a well run game, streamlined registration, good props, good rule set and a ref staff that is 100% paintball players. There will be food, as well as paintball vendors. Camping is encouraged. There isn’t any toilet facilities, but there are plenty of porta-potties. Fires are authorized, as long as you have a steel fire ring. 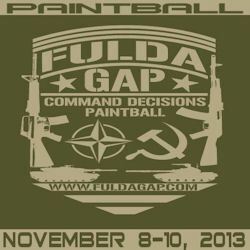 Two day games and a night game, situated in one of the better paintball venues in the Southeast USA. There are 78 playable acres, complete with firebases, observation posts, trenches and forts. You can expect 1000+ players. Paintball Tank, Heavy Weapon, Nerf launcher and First Strike friendly. The paintball velocity is 280 FPS and all paintball firing modes allowed, but you must keep the ROF below 13 BPS, including any ramping modes. No exceptions. Tank paintball velocity is set at 250 FPS. The night game velocity is 230 FPS and up to 20 night vision goggles are approved for each side. Nerf launcher velocity is set at 230 FPS. Please visit http://www.fuldagap.com/index.shtml for all the game information. Registration is $55 per player, until midnight on Sep 30. From Oct 1 to midnight on Nov 3, it’s $60. The reg fee is $70, at the door. This is a Valken paint game and the prices are $45 and $55 per case. Contact Sir Raymond at HarlyHunk@hotmail.com for details. Last edited by HarlyHunk : 09-27-2013 at 06:14 AM.